You have probably worked hard to become a dental hygienist up to this point, but now the really hard work begins — finding a job in the dental hygienist field. 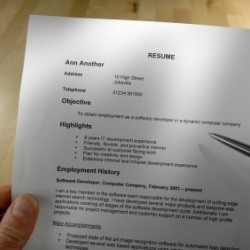 Fortunately, having an appropriate dental hygienist resume or CV will do a lot to help you to nab your dream job. Here is how to create one. Although 96 percent of dental hygienists work in the offices of dentists (according to the U.S. Bureau of Labor Statistics), their job duties are not necessarily the same. Rather, the work requirements of dental hygienists may vary greatly between dental offices. If you want to increase your chances of being hired by one of these dental practices, therefore, you must take some time investigating the dental practices in which you want to work. Not only will this help you to gear your resume to the exact job requirements of the practice, but it will also help you to decide whether the practice will fulfill your career needs. There are many ways to investigate specific dental practices. Use the Internet. An Internet search will tell you the location and size of the practice, the specialty of the dentist (pediatric dentists, for instance, specialize in the dental needs of children) and even specific dental techniques that the practice offers the patients. This preliminary search will give you important information about the specific dental practice and whether or not you might be interested in working there. Use this information to narrow down your list of career prospects. The ratio of patient groups (i.e. children, elderly, men, woman, etc.) in this dental practice. Write down the answers to each of these questions. Their answers to these questions will help you to decide whether you would like to work there — and how you should write your resume to fit that particular dental office. Note that some practices will not want to divulge this information over the phone — in that case, these questions can wait until the job interview. Armed with the information from your Internet and telephone investigation, you are now ready to write a winning dental hygienist resume. Using the following dental resume template as a guide, make sure that you stress the educational and experiential skill sets that seem important to that individual dental office. Try to keep it to one page, but two pages is OK if you have a long work history. 5) Career Objective — Using the information that you have gathered about the dental office, formulate a concise statement about your career goals that incorporates what is particularly important to them. For example, if you are applying to a pediatric dental office, be sure to stress your experience or training in working with children. 6) Summary of Qualifications — Four or five bullet points of your exact qualifications for working at their dental office (again, using the knowledge that you gleaned from your preliminary investigation). 7) Education — Name of dental hygiene program, year of graduation, license obtained. You may also list specific courses that you took which fits some of the particular requirements of the dental practice. 8) Experience — In reverse chronological order, you should list your previous employment. However, if you are looking for your first dental hygienist job, you will not have any employment experience to offer, therefore, you may want to skip to number 9. 9) Special Skills — This section lists particular skills that you gained while attending your dental hygienist program. Again, gear these skills to those that will be valued by the targeted dental office. Follow these tips, and you may soon be working as a dental hygienist. Good luck! Of commercial statistical computing web sites system s-plus.